How do students know what we want them to learn? 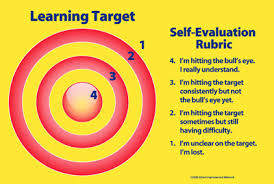 By design, a learning target focuses on what is important for students to learn today and on the criteria they will use to assess the quality of their learning-not on the score or grade they should aim for. Moss, Connie M., and Susan M. Brookhart. Learning Targets: Helping Students Aim for Understanding in Today's Lesson. Alexandria, VA: ASCD, 2012. Print. Why spend time writing learning targets for students? "...teacher expertise-what teachers do and how they do it-accounts for 30% of the factors that influence student achievement. Clearly, what teachers do matters." Do these definitions of learning targets fit with your understanding? Now, it's your turn! Post your personal definition of Learning Target.